Incline Village, Nevada – Xeric Design has launched a beautiful new cloud image service for EarthDesk Data subscribers. The cloud image is now precisely geo-located and parallax-corrected, contains data from up to 23 satellites, and includes polar coverage. We have worked with the Space Science and Engineering Center’s RealEarth project at the University of Wisconsin, Madison to bring this high-quality data feed to EarthDesk. Previously, only six satellites were used and the data did not extend to the poles. * Mac OS X 10.10 or later. * Windows 7 or later. Xeric Design, based in Incline Village, Nevada, is a leader in global time and mapping software. 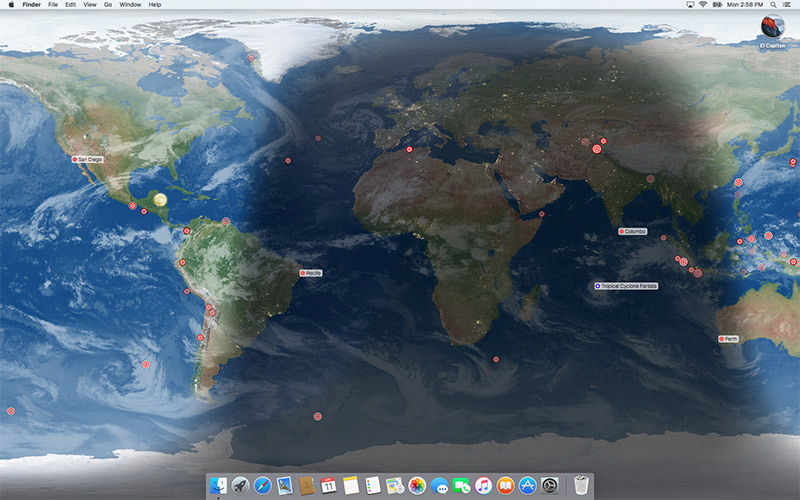 Its flagship product, EarthDesk, for both Macintosh and Windows, is enjoyed by users in more than 140 countries. Copyright (C) 2019 Xeric Design. All Rights Reserved. Apple, the Apple logo and Mac OS X are registered trademarks of Apple Inc. in the U.S. and/or other countries.